Amateur Radio Emergency Service® (ARES®) teams in three states activated in the past week for weather-related emergencies. The Billings, Montana Director of Emergency Services activated the Yellowstone County Amateur Radio Emergency Service (ARES) group (YARES) on May 26 to support radio communication for sandbagging stations and possible river-level spotting duty in advance of an anticipated significant flood event, YARES Emergency Coordinator Ron Glass, WN7Y, told ARRL. Glass said the request from the County Office of Emergency Management called for staffing five sandbag centers last weekend, "helping to coordinate logistics and supplies to get tens of thousands of sandbags into the hands of citizens and communities to prepare for the historic flooding to hit the area," Glass said. As "sandbag center managers," he said, the ham radio volunteers were the only officials on site, logging in everyone who stopped by to fill sand bags. "As we say in YARES, 'If you have a radio in one hand, a clipboard in the other, and you are wearing a safety vest, everyone assumes you are in charge!'" Glass quipped. As it turned out, the record-breaking flooding did not occur, and ARES was able to stand down after 3 days. Seventeen volunteers staffed locations along the rivers and bridges that have been trouble spots in the past. Glass said that while significant rainfall did hit Billings, it was not as heavy as initially predicted. River levels dropped on Monday by more than 1 foot from what had been expected earlier, and cooler temperatures slowed the melt of a record snow pack. By mid-week, though, Glass said he was following new severe weather forecasts from the NOAA Storm Prediction Center. On May 27, ARES volunteers in the Maryland-DC Section activated in the wake of regional flash flooding. Especially hard hard was Ellicott City, where vehicles were washed away by fast-moving flood waters upward of 10 feet deep. One person died as a result of the flooding. "As many watched Alberto, radio amateurs in Maryland watched more and more rain locally," ARRL Assistant Maryland-DC Section Manager and Public Information Coordinator Ken Reid, KG4USN, said on Sunday. "By 5 PM, heavy rain, as much as 8 to 10 inches, soaked portions of central and southern Maryland." The flooding disaster was the second since 2016 in historic downtown Ellicott City, which was still recovering from the earlier event. Section leadership asked radio amateurs in the flood-affected areas to check on the health and welfare of their neighbors. Reid said high-water rescues were needed in Perry Hall and Patapsco State Park. 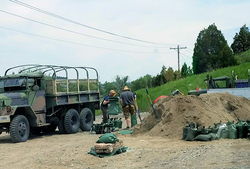 When the flooding quickly became serious in several locations, MDC Section Manager Marty Pittinger, KB3MXM, activated ARES in eight central Maryland counties at 6:30 PM EDT, and 15 minutes later, more than 40 ARES volunteers reported to their respective 2-meter nets in five counties. The majority of flood-affected communities were in Anne Arundel, Prince George's, and Howard counties. Amateur Radio volunteers in the MDC Section provided additional situational awareness, and Pittinger interfaced with Atlantic Division leadership, Maryland Section Emergency Coordinator Jim Montgomery, WB3KAS, and state and local authorities. "Many county [emergency operations centers] in affected areas were also activated. Anne Arundel County ARES and Howard County ARES were in communication with their local Emergency Management Agencies and were both told to stand by in case of need," Reid said. Maryland Governor Larry Hogan declared a state of emergency. Conventional telecommunications continued to function throughout the heavy weather, which caused road closures and power and natural gas outages. The MDC ARES volunteers remained on duty until 10:15 PM on May 28. During the activation, radio amateurs made use of VHF, UHF, and HF capabilities, as well as Voice over Internet Protocol (VoIP) modes. West Central Florida (WCF) Section ARES went to a Level 3 activation (standby) on May 26 after tropical storm warnings went up for the coastal areas of WCF Section counties and for all of Pinellas County. "We will continue at the Level 3 activation until the Tropical Storm warnings are discontinued for all WCF Section counties," ARRL West Central Florida Section Manager Darrell Davis, KT4WX, told ARRL at the time. Alberto shifted away from that part of the Florida coast and came ashore on the Florida Panhandle, moving inland and dissipating, but still causing serious rainfall and some flooding. US Army Military Auxiliary Radio System (MARS) headquarters is recommending that MARS members "migrate to standalone computer systems for [MARS] radio operations," subject to the availability of a dedicated computer. "These computer systems (or their associated local area networks) should be 'air-gapped' from the internet," Army MARS Headquarters Operations Officer David McGinnis, K7UXO, said in a message to members. "Although not a requirement for membership at this time, we will continue make this a condition of certain parts of our exercises." McGinnis pointed to remarks by Cisco researchers in a recent Ars Technica article that discussed how hackers "possibly working for an advanced nation" have infected more than a half-million home and small-office computers "with malware that can be used to collect communications, launch attacks on others, and permanently destroy the devices with a single command." McGinnis told Army MARS members that MARS Headquarters does not discuss specific cyber threats with MARS members or with the public. "We also cannot confirm or deny information about specific threats," he said, adding that he had "no specific knowledge" about VPN Filter malware and no comment on the Cisco report. For communication exercises this year, MARS established conditions for a certain portion of the drill that requires use of standalone computer systems "normally not connected to the internet." He said used or refurbished PCs are widely available at low cost and could be dedicated to serve a standalone function. "The most effective way to protect against threats that come from the internet is to isolate from the internet," McGinnis added. "Despite a standalone environment, we assume that all computer systems in private citizens' hands are infected with hostile software code of some sort and are not secured," he said. "No amount of virus and malware scanning software changes that assumption. We can, however, isolate computers by disconnecting them from the international network in which hostile software will report and receive instruction." McGinnis said future versions of MARS software will check for an internet connection and will disable the software. "We understand this lockout does not provide security in and of itself; rather, its value is in changing the behavior of members," he explained. MARS Program Manager Paul English, WD8DBY, told ARRL that the MARS goal is to isolate MARS members' computers from the internet as much as possible and that isolating members' computers used for MARS-related activity is "a goal, but has not been directed." "Coping with Poor HF Conditions" is the topic of the current (May 24) episode of the "ARRL The Doctor is In" podcast. Listen...and learn! Just ahead: "Field Day Antennas." 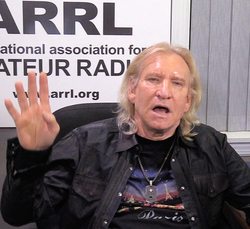 Legendary rock guitarist Joe Walsh, WB6ACU, of the Eagles is featured in a just-released set of ARRL audio and video public service announcements promoting Amateur Radio. ARRL will provide the 30- and 60-second PSAs to Public Information Officers (PIOs) to share with their Section's television and radio stations. The ARRL Media and Public Relations Department also will provide these announcements files directly to interested television and radio outlets, and the announcements are available for downloading from the ARRL website for members to use in promoting Amateur Radio at club meetings and public presentations, such as ARRL Field Day on June 23-24 (PSAs specifically for ARRL Field Day also are available). Those PSAs will also be available for download from the ARRL website, so that members can present them at club meetings and other public gatherings. Tips for getting audio PSAs on the air are available on the PSA for promotions web page. The chair of the International Amateur Radio Union Region 1 (IARU R1) VHF-UHF-µW Committee, Jacques Verleijen, ON4AVJ, has highlighted extant threats to the Amateur Radio spectrum above 30 MHz. In an editorial that heads the latest edition of the IARU R1 VHF-UHF-µW Newsletter, issued on May 29, Verleijen invited all IARU member-societies to consider ways to "promote, defend, and use our frequencies." "They are wanted by others, both government and commercial users," Verleijen wrote. "So, this is a wake-up call to be aware that if we are not using those bands, we will lose them." If that happens, he continued, it won't be the fault of IARU R1, but of the amateur community that "often [has] more commitment to HF" than to VHF and higher bands. Conceding that the HF bands "are the easiest to use," Verleijen said member-societies should think outside the box to come up with ideas to improve VHF, UHF, and microwave activity. Verleijen said the vast amount of Amateur Radio spectrum from 50 MHz through 5 GHz makes it an attractive target for commercial and governmental interests. He noted that 50 MHz is the focus of a key World Radiocommunication Conference 2019 (WRC-19) agenda item -- specifically, to harmonize the 6-meter allocation across all three ITU Regions. "It would be unfortunate to see a repeat of the WRC-15 result for 5 MHz, where high hopes and years of hard work actually resulted in a few kilohertz at 15 W [EIRP] max," Verleijen continued. A repeat of that situation on 6 meters could mean a "far more devastating" loss of existing spectrum and future opportunities for digital innovation. The 2.3 GHz and 3.4 GHz bands are highly sought after for commercial wireless, Verleijen said, pointing out that the UK recently auctioned large segments of 2.3 and 3.4 GHz spectrum once available to Amateur Radio, "threatening significant activities from narrowband/Earth-Moon-Earth to DATV (digital amateur TV)." Two WRC-19 agenda items affect 5 GHz, focusing on Wi-Fi and so-called "intelligent transport." Amateur Radio, as a secondary service, faces another difficult challenge in this part of the spectrum and has "little influence over its direction," Verleijen contended. In IARU Region 1, the primary concern is the expansion of Wi-Fi into 5,725 - 5,850 MHz. "[O]ur preoccupation with traditional or [narrowband] modes does not justify the amount of spectrum," he said, noting that "some activity levels are quite low" outside of contests. "Ideally, we need genuine open innovation and to show amateurs leading in the 21st century," Verleijen said. "Pressures on amateur bands are nothing new, but we know that the spectrum pressures above are not helped by poor engagement, relationships, or lack of a united approach" in some member-societies, with respect to their administrations. China launched two microsatellites into a lunar transfer orbit on May 20 in conjunction with the Chang'e 4 mission to the far side of the moon. The Longjiang-1 (LJ-1) and Longjiang-2 (LJ-2) microsats were secondary payloads on the launch, piggybacking on the Queqiao relay satellite. Also known as DSLWP-A1 and DSLWP-A2, the satellites were maneuvered onto a track to the moon, but LJ-1 then appeared to have encountered problems, and Harbin Institute of Technology, which developed the satellites, was asking for help from the world Amateur Satellite community. 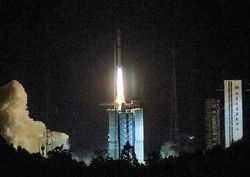 The May 20 launch of LJ-1 and LJ-2, which piggy-backed on the Queqiao relay satellite. "We lost contact with Satellite A on S band after an orbit adjustment," Wei Mingchuan, BG2BHC, of Harbin Institute of Technology said. "We just tried to switch on UHF, but we don't know if it works or not." He said on 435.425 MHz, the satellite should alternate between 500 bps GMSK and JT4, while the 436.425 MHz signal should be 250 bps GMSK. Both transmit once every 5 minutes. LJ-1 and LJ-2 also will test low-frequency radio astronomy and space-based interferometry. The astronomy objectives of the two spacecraft are to observe the sky at the lower end of the electromagnetic spectrum -- 1 MHz to 30 MHz -- with the aim of learning about energetic phenomena from galactic sources, using the moon to shield them from earthbound radio signals. The Chang'e 4 mission will mark the first-ever attempt at a soft landing on the far side of the moon. 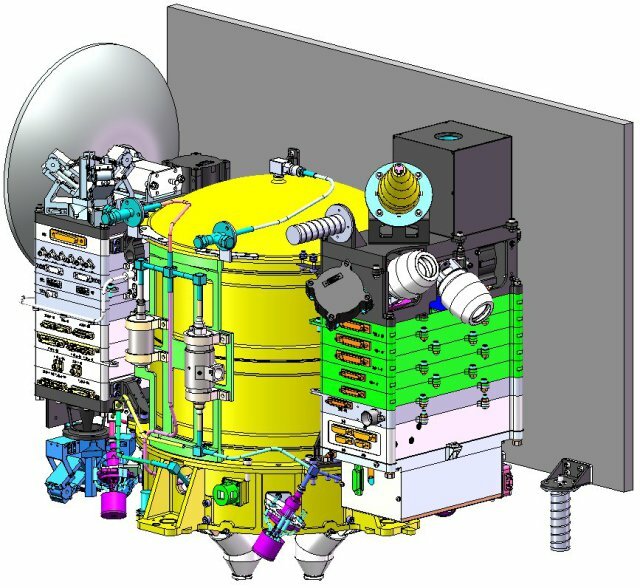 Artist's rendering of the DSLWP spacecraft. Signals from the DSLWP satellites were received after launch by radio amateurs in Brazil, Chile, and the US, as well as by many others around the world. Each satellite carries VHF/UHF SDR transceivers for beacon, telemetry, telecommand, and digital image downlink. Onboard transmitting power is about 2 W.
The Queqiao communications relay satellite is required for the lunar far-side landing to facilitate communication with a not-yet-launched lander and rover, because the moon's far side never faces Earth, and some significant scientific measurements from the dark side of the moon require real-time contact with Earth. Queqiao was developed by the China Academy of Space Technology (CAST). 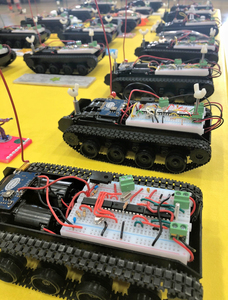 An Amateur Radio-based science, technology, engineering, and mathematics (STEM) initiative at an Arizona elementary school culminated on May 22, as youngsters competitively deployed their own radio-controlled rovers to explore a simulated planet set up in the Sonoran Desert. Following in the footsteps of NASA scientists, 25 pupils at Bouse Elementary School -- several already holding ham radio licensees -- took part in the APS Arizona Rover Project, which is aimed at promoting STEM subjects through Amateur Radio and preparing young participants to earn an Amateur Radio license. 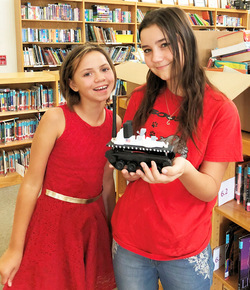 Anna Dautel, KI7WOJ (right), and Skyla Herman, KI7WPC, pose with one of the 20-some rover prototypes. The rover is a dual-motor small tank chassis running off 6 V worth of AA batteries. Remote control of each rover is accomplished by using dual-tone multi-frequency signal tones from their radios. "It was awesome!" said Dave Anderson, K1AN, the president of My La Paz, which sponsored the project in cooperation with Arizona Public Service (APS) and community volunteers. The nonprofit My La Paz promotes health, education, and community in La Paz County. "The youth all had the chance to explore the artificial planet, the event was well attended, and the radio links for remote control and video were rock solid." "Its primary goal was to lift up and inspire the youth into science and learning via instruction and exploration of radio science, Amateur Radio, and space research," Anderson told ARRL. "The goals of the program were to deliver science instruction that met and exceeded Arizona Common Core educational guidelines and to help the youngsters prepare to attain their Amateur Radio licenses." A unique facet of My La Paz is its focus on Amateur Radio, Anderson said, because of what it can offer the county's young people in sparsely populated La Paz County, where many families live at the poverty level. "In many ways, Amateur Radio has become the students' first social media, since many of their homes have no computers or internet access," he told ARRL. "It no longer matters where a youth lives or their family income; they can now participate in learning opportunities or making new social connections and friends via the Desert Amateur Radio network." The number of youngsters now licensed across La Paz County is approaching 100. "The students of this generation are fascinated by space exploration and robotics," Anderson said. "And the rover project provides a way to let them explore this with radio science and be inspired into learning while making science fun." QST has been honored with the E.T. Krenkel Medal. 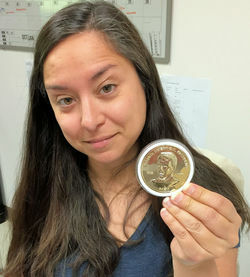 In making the award, being held here by QST Managing Editor Becky Schoenfeld, W1BXY, the Russian National Academy of Researches and Discoveries commended QST for "outstanding global contributions to Amateur Radio." The award's namesake, Ernst Teodorovich Krenkel, was a radio amateur who, over the years, used the call signs RAEM, U3AA, and UA3AA. The Polish-born Krenkel was an Arctic explorer who took part in the first Soviet "drifting station," North Pole-1 and was made a "Hero of the Soviet Union" in 1938 for his exploits. Krenkel's son, T.E. Krenkel, was among the four signatories to the award certificate. He said his father was an avid radio amateur who served as the first chairman of the Central Radio Club in the USSR. E.T. Krenkel's image appears on postage stamps from the USSR and Russia, and he authored a biography entitled My Callsign is RAEM. In the era when all radio amateurs received QSL cards via Box 88, Moscow, Krenkel was allowed to have his own postal address on his QSLs and was issued the non-standard RAEM call sign. 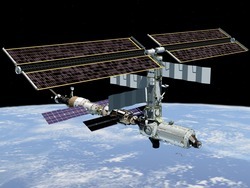 Radio Amateurs are set to swap spots on the International Space Station (ISS) crew. One radio amateur now aboard the International Space Station will be heading home on June 3, while another will take his place on the crew a few days later. Flight Engineer Scott Tingle, KG5NZA, will join Expedition 55 Commander Anton Shkaplerov and Flight Engineer Norishige Kanai in returning to Earth on the Soyuz MS-07 spacecraft after 168 days on station. A few days later, another trio of space travelers -- Alexander Gerst, KF5ONO; Sergey Prokopyev, and Serena Auñón-Chancellor -- will head to the ISS in a Soyuz MS-09 spacecraft. In a traditional change-of-command ceremony on June 1, Shkaplerov will hand over command of the station to NASA's Drew Feustel, officially starting Expedition 56. In addition to Feustel, Ricky Arnold, KE5DAU, and Oleg Artemyev will remain on station. This will be the "Horizons" mission for Gerst, of the European Space Agency, who will assume command of the ISS during the second half of his duty tour. Gerst first served on the ISS in 2014 and likely will use the call sign DP0ISS for any Amateur Radio on the International Space Station (ARISS) activities. Tad Cook, K7RA, Seattle, reports: The Australian Space Forecast Centre has issued a warning for increased geomagnetic activity on June 1, "due to arrival of the co-rotating interaction region and high-speed solar wind streams associated with the recurrent trans-equatorial coronal hole." The sun remained active over the reporting week. Average daily solar flux rose from 70.1 to 74.9, and average daily sunspot number jumped from 7.7 to 26.3. The first 4 days of the previous reporting week saw no sunspots. 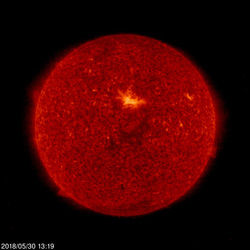 Predicted solar flux is 75 and 74 on May 31-June 1; 73 on June 2-4; 72 on June 5; 70 on June 6-7; 71 on June 8-9; 72 on June 10-14; 70 on June 15-17; 72 on June 18-23; 73 on June 24; 72 on June 25-30; 70 on July 1-6; 72 on July 7-11, and 70 on July 12-14. Predicted planetary A index is 5, 16, 26, 16, 12, 10, and 8 on May 31-June 6; 5 on June 7-12; 8 on June 13; 5 on June 14-18; 8 on June 19; 5 on June 20-23; 8 on June 24-25; 5 on June 26-27; 15, 28, 15, 12, 10, and 8 on June 28-July 3; 5 on July 4-9; 8 on July 10, and 5 on July 10-14. ARRL Field Day is June 23-24. Assuming the predicted numbers hold up, conditions should be favorable. Sunspot numbers for May 24 through 30, 2018 were 39, 32, 26, 27, 20, 22, and 18, with a mean of 26.3. The 10.7-centimeter flux was 73.7, 75.7, 72.9, 74.6, 76.9, 74.9, and 75.3, with a mean of 74.9. Estimated planetary A indices were 4, 3, 4, 4, 4, 4, and 4, with a mean of 3.9. Estimated mid-latitude A indices were 5, 4, 5, 5, 4, 5, and 5, with a mean of 4.7. Subscribe to the ARES E-Letter (monthly public service and emergency communications news), the ARRL Contest Update (bi-weekly contest newsletter), Division and Section news alerts, and much more!